Blue solar panels glinted as far as the eye could see under a glorious sunny winter sky Wednesday as a van full of reporters and photographers bumped along the dirt road along the edge of OCI Solar Power’s 453-acre property. After months of construction, the 167,000 panels are now generating clean, emissions-free power for about 6,600 homes. 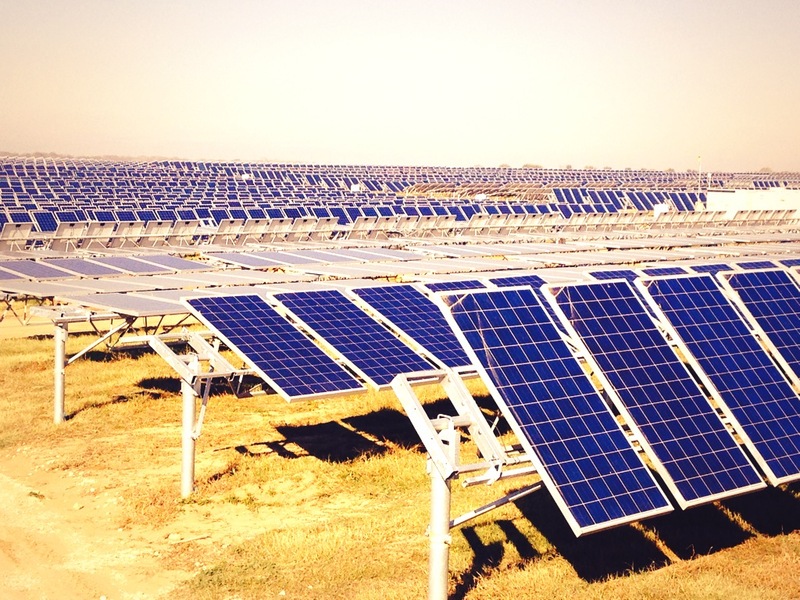 167,000 solar panels, some single and other dual axis, will generate 40 MW of power for CPS Energy. CEO Tony Dorazio said OCI Solar Power and its partners are ahead of the job creation schedule it agreed on with CPS Energy, and continues to bring on partners. Minneapolis-based Mortenson Construction plans to open a regional headquarters in San Antonio, Dorazio told Sanford Nowlin of the San Antonio Business Journal Wednesday, while New Jersey’s WTEC will move production of its combiner boxes for solar arrays here. Supplier KAKO, for example, recently opened a 25-employee plant here, with plans to grow to 70. The German firm makes the gear that converts power harvested from solar panels into usable electrical currents. And ERCAM Trackers, producer of the equipment that rotates solar panels, already has hired 100 people here. It will expand its payroll to keep up with OCI’s construction, spokeswoman Ana Morales says. CPS Energy has dubbed this clean energy industry investment its New Energy Economy initiative. On Monday, the utility’s board of trustees heard an update that CPS Energy’s partner companies, including OCI Solar Power, have created 273 jobs, invested $35 million in capital expenditures and contributed more than $1 million to local educational institutions thus far. Construction is underway on the next solar site, a small 4.4 MW farm on land owned by the San Antonio River Authority, and a job fair was recently held here and in Bracketville for another roughly 40 MW site in that area. The final sites will be in West Texas, Dorazio said, because the sun burns ever hotter there than in San Antonio. Those sites will be roughly 100 MW each. The power is valuable to CPS Energy for a couple different reasons, said Cris Eugster, executive vice president and chief generation and strategy officer. The price is fixed for 25 years, and so serves as a hedge against rising fuel costs, is generated when CPS Energy needs it most, during hot afternoons when demand is highest, and helps reduce the utility’s overall emissions. “This is the type of power we want and need,” he said.